Do you need emergency road recovery? You never know when your car is going to suddenly stop working on you. And it’s not always between the normal business hours of 9-5. If you’re stuck on the side of the road late at night, what are you supposed to do? Should you wait until the morning? Staying on the road is dangerous. 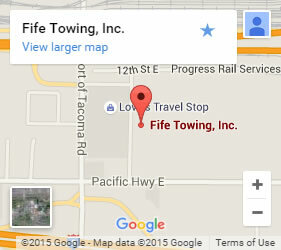 Instead, call us up at Fife Service & Towing for fast emergency towing in Lakewood. We’ll come and get you and make sure you get home safely. Don’t need a full tow? We also offer emergency roadside service! If you run out of gas, you’re locked out of your car, or you just need a quick pull out of the mud to get you on your way, we can help you there too! We’ll even help you get your tire changed if you’re missing equipment or forgot how it’s done. Stuck in an unusual situation? 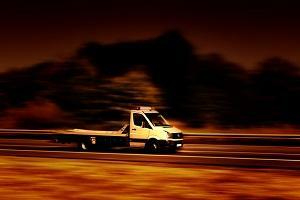 Emergency towing is more than just late night vehicle recovery. In the unfortunate event that your vehicle ended up off a bridge and into the water, what can you do? Is it lost for good? Not necessarily. Along with our commercial towing services, we have a heavy-duty tow truck equipped with a crane exactly for these kinds of situations. Our stong vehicles combined with our nationally-certified tow truck operators can likely get you out. These trucks are equipped with a powerful winch system strong enough to pull vehicles out of the water and get them back on the road. Looking for quality towing service? With over a 4 star rating on Facebook, when it comes to towing, we’re the star! As a fourth-generation company, we’ve experienced everything there is to do in towing. And we know that waiting around for a truck to show up is one of the most irritating and anxious things you can do. That’s why we strive to provide the fastest service in the area, so you aren’t left waiting. When you choose us, we’ll get you and your car back home where they belong. So when you have an emergency, give us a call fast so you can get back to your life!